You can create query reports to get specific data from Password Manager Pro database, by either writing your own SQL query or customizing a SQL query from existing reports under this category. Passwords that haven't been changed at all after resource creation. How to create query reports? You can run query reports in Password Manager Pro in two ways, either by using default queries or by constructing your own SQL query by referring to the Tables Schema displayed in the product GUI. 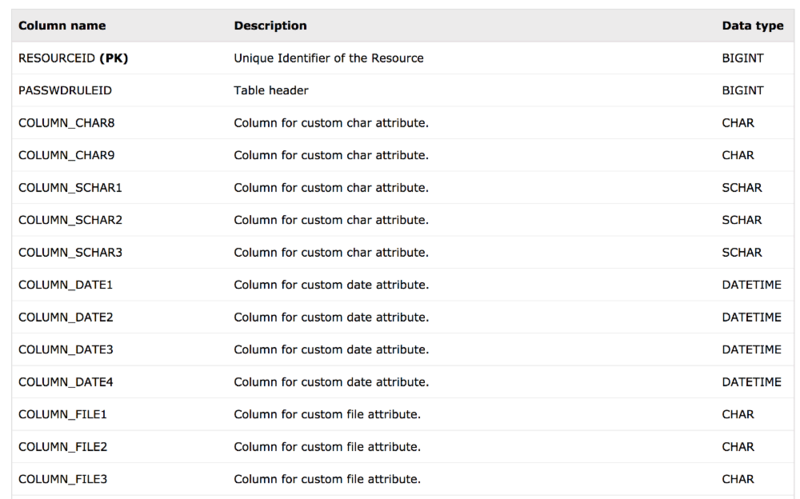 Default query reports can be found under pre-defined categories - Resource Groups, Resources, User Groups, and Users. Navigate to Reports >> Query Reports. Click on Create Report, available on top right hand corner. In the GUI that opens, provide a name for the query report being created; also enter a description for easy identification of the report. Next, select Report Category for the report. You can either choose one of the pre-defined categories or add a new category. To create a new category, click on Add New option beside the Report Category field. Set Privacy for the report—Everyone (or) Only me—depending on data sensitivity and need. Once you have entered the query, click Generate Report. If you have created the report for future use, click Save. The report will be saved. decrypt(COLUMNNAME) - To select any encrypted column While using encrypted columns, remember to give them alias names. How to know whether a column is encrypted? To know which columns are encrypted, go to Query Reports-->Tables Schema. In the dialog box that opens up, scroll down to the list that displays the column name, description, and data type of each table. Under data type, look for SCHAR. Columns of the data type SCHAR are encrypted. Find below the SQL statements written for a few use case scenarios. This report helps you to ascertain whether the passwords checked-out by users for auto-logon to a target system, were reset after use. Resetting a password after user access is critical, since it is possible the user may have noted down the password for future use. Therefore, using this query report, you can get the list of passwords not yet reset after auto-logon and update them instantly. Use this report to determine the list of passwords that have not been reset even once after resource creation in Password Manager Pro. Periodic password resets are important and this report helps track all the resources that have outdated passwords. You can also rewrite the following query to find out the passwords haven't been changed for resources, added during a particular period. How to schedule query reports? Locate the required report and click on the Schedule Report icon under Report Actions column beside the report. In the pop up form that opens, select the required schedule - day(s) / monthly / once, and also provide the date / time at which the schedule has to commence. Next, choose the format in which the report has to be mailed to the recipients, PDF or XLS or both. Select the recipients to whom the report should be mailed to, from the given options. You can also provide a custom list of email ids instead. Click on the Schedule Report icon under Report Actions column beside the report. In the pop-up form that opens, select the option Never. Click Schedule. The schedule will be terminated. To easily locate a frequently used or critical report, you can mark the report as favorite by clicking on Mark as Favorite star icon shown before the name of each report. Click the 'Edit Category' icon present against the desired category, under 'Category Actions' column. In the pop-up form that opens, you can change the name for the category. Click the 'Delete Category' icon present against the desired category, under 'Category Actions' column. In the pop-up form that appears, Click "OK". Note: In order to delete a category, you have to first ensure that no reports exist under it. If there are reports, you can move them to another category. Click the 'Move Reports' icon present against the desired category, under 'Category Actions' column. In the pop-up form that opens, choose the category to which the reports must be moved.